The following article is excerpted from a paper I submitted as part of a Biology class environmental preservation writing project. The project focus was on preservation of the American Southwest desert. I choose prehistoric rock art as my topic. Rock art is being destroyed at an unprecedented pace. I ask the question, "Do we know what we are destroying?" Herein follows a summary of a scientific paper illustrating recent developments in rock art dating. I present it to illustrate how we are only just beginning to study and understand rock art. Thereafter follows my Commentary on the issue of rock art conservation, plus the list of references cited. by S. D. Chaffee, M. Hyman, M. Rowe, N. Coullam, A. Schreodl, K. Hogue. 1994. American Antiquity 59(4):769-781. 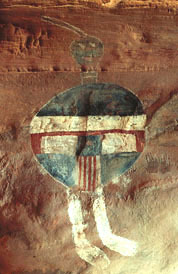 A very unique pictograph on Upper Salt Creek of Canyonlands National Park, Utah, the All American Man Pictograph, has a circular torso painted in red, white and blue stripes. The figure is in an Puebloan habitation alcove. Puebloan style handprint pictographs are also present. The color resemblance to the American flag and modern claims of embellishment led archaeologists to question its prehistoric authenticity. This and the rare coloration and style led to the desire to test the age of the pictograph. Two small, well conserved tabular sandstone masonry structures of Puebloan origin are in the alcove. A small storage structure may have been present, as well as an artificial floor below the pictograph. Smoke blackens the ceiling. Archaeological evidence, particularly ceramics, indicates a late Pueblo II-Pueblo III site. Small flakes of exfoliated, blue paint were found at the site. Optical microscopic examination determined the microstratigraphy of the samples and that the flakes were free of modern contamination. Dating is only attempted when no overpainting is evidenced. A white layer was noticed under the paint. Using scanning electron microscopy (SEM) a natural calcium and sulfur surface accretion due to fluid migration in the rock substrate was found. After plasma extraction of the carbon X-ray diffraction (XRD) was employed to determine mineral composition of the natural surface mineral accumulations. The XRD confirmed the SEM results. The spectrum revealed quartz from the sandstone and calcium sulfate and a calcium oxalate derived from gypsum. The carbon extraction methodology is discussed. A radiofrequency (RF) generated low temperature, low pressure oxygen plasma is used to separate carbon from the pigment by oxidation to carbon dioxide. The conditions are sufficiently mild such that the selective removal of the organic phase occurs. In the plasma system a high vacuum prevents contamination by atmospheric carbon dioxide. Less than 1 millitorr of carbon dioxide is tolerated. Before the sample introduction, after five hours of pressure observation, an argon plasma produced only 0.0007 mg of carbon. Total modern carbon contamination of the sample is calculated at < 1.4 percent. A 1.06 gram sample of rock and pigment was thoroughly degassed. A cooper oxide furnace heated to 900.C introduced pure oxygen. With oxygen pressure at 1.0 torr liquid nitrogen was introduced and the RF generator produced a plasma for an hour. About 280 millitorr of carbon dioxide was produced. A second treatment produced 130 millitorr after 3 hours. The amount of carbon is calculated from the number of moles of carbon dioxide. The samples were sent to the National Science Foundation-University of Arizona Accelerator Mass Spectrometry Laboratory. A 4.5 hour third treatment produced insufficient carbon for accurate radioactive analysis. Treatment results are summarized in Table 1 of the article. Previous tests demonstrated no decomposition of natural, fully oxidized carbonates in rock substrates at the operation level of 100 watts of RF plasma power, as illustrated in Figure 8. The methodology is therefore applicable to limestone substrates. No radioactive carbon contamination from magnesium carbonates, calcite or from gypsum derived calcium oxalate accretions on sandstone should occur at 100 watts of power. Results discussion follows the methodology presentation. The Arizona AMS sample results are presented in Table 2. The first sample is dated as 175 years older than the second. The first sample may have contained all carbon from the charcoal fraction in the paint, and the second sample carbon from organic binders. A problem in archaeological dating of charcoal is that the charcoal can be "old wood." The authors conclude that "the best estimate of the age of the All American Man pictograph is the weighted average of 676 ±46 years BP." The antiquity of the blue paint was confirmed. This does not preclude historic alteration of the red and white portions of the pictograph. The National Park Service's conservation policy only allowed dating of naturally exfoliated samples. The ± AD 1295 date closely matches a ± AD 1284 date obtained from nearby Ceremonial Cave, in the Escalante drainage across the Colorado River from the All American Man. The authors speculate on the implications of these findings with reference to cultural affiliation, directions of cultural influence, diffusion and migration, and modern rock art typology. The dates correspond to the Great Drought when an estimated 30,000 people migrated from the region. Salt Creek has a significant, reliable spring with heavy flow. The authors end with the conclusion that dating techniques such as those employed in their study can be used to test hypothesis about migrations, cultural diffusion and style distribution. The first dating of pictographs by selective oxidation of carbon (Russ et al. 1990) was of paintings from the Lower Pecos region of southwest Texas only a few years after numerous Lower Pecos sites were inundated by Amistad reservoir. Rock art 3,500 years old was destroyed less than 20 years before the dating method was developed. ". . . the giant machines of Valley development are grinding the carvings into gravel to make roads and line washes. "Archaeologists fear we could be wiping out messages from generations of ancient civilizations, destroying some of the world's oldest archives. . . ."
"Now, 48 percent of those panels are destroyed or missing. Native Americans compare the destruction to the looting of a library or a temple." These examples are typical of many sites. The same scenario has been repeated many times in the name of progress. Present day laws provide no protection for cultural resources on private property. Until laws are enacted property owners are at liberty to destroy cultural resources. Only human physical remains are legally protected on private property. The meaning or meanings of the pictographs and petroglyphs are most certainly not known to those who are destroying them. This situation is reminiscent of the destruction of the screenfold codices of Mesoamerica by Europeans at the time of conquest. From all the prehistoric libraries in Mexico and Central America only thirteen books are known to survive today. Proselytizing Spanish priests led the cultural overthrow responsible for the burning of prehispanic literature. Their inquisition sought to destroy all native imagery, not just codices. The friars viewed the works as pagan and therefore demonic, the work of Lucifer, the product of false religion, and a threat to promotion of their religion. They did not know the actual meanings of what they were destroying. Prehistoric science was viewed as paganism. Only in retrospect do we understand the magnitude of the loss of the prehispanic Native American libraries. Regretfully the destruction is done and the loss cannot be recovered. Will a similar hindsight about rock art be part of our future paradigm? Will we soon discover some as yet unknown scientific value of rock art just after we have destroyed so much of it? There is ample evidence to suspect so. Petroglyphs in Mexico have been demonstrated to be of calendric significance (Aveni et al. 1978, Aveni 1989.) As early as 1979, beams of light in conjunction with petroglyphs were shown to be used as calendrical devices in the Southwestern United States (Sofaer et al. 1979.) Subsequently other sites with astronomical associations have been reported (Science Digest 1983, Mixon et al. 1991, O'Meara 1994). Navajo rock art includes ceilings of alcoves painted with star maps of recognizable constellations (Grant 1978.) Architectural features at Casa Grande Ruin in Arizona demonstrate observation of lunar standstill events (Evans et al. 1979.) Construction of Chimney Rock Ruins in Southwestern Colorado is temporally equated with lunar standstills (Mayville et al. 1991.) Structures 23 miles apart in the Sacramento Mountains of New Mexico are aligned with the solstice sunrise (Eidenbach 1981.) These are a few of many possible examples. Perhaps in the future we will also be able to read or otherwise decipher rock art. The petroglyphs and pictographs destroyed by subdivisions, reservoirs and other alterations of the primordial landscape are, like the codices, lost forever, often without documentation. We need to take steps to protect rock art and other cultural resources on private property. The demands of a single generation should not be allowed to destroy the work of all previous generations, especially if it could represent a summation of their intellectual accomplishments. Rock art should be accorded the same respect as the dominant culture has for its own oldest literature and oldest surviving books. Would the dominant culture allow half the Bible to be thrown into a paper recycler and lost forever to print tomorrow's paper? The treatment rock art receives is analogous. Without legislation protecting cultural resources on private property the destruction can continue, and will. Background image is Big Pocket panel, pictography near the All-American Man. Aveni, Anthony F., H. Hartung, and B. Buchingham. 1978. The Pecked Cross Symbol in Ancient Mesoamerica. Science 202(4365):267-279. Aveni, A. F., 1989. Pecked Cross Petroglyphs at Xihuingo. Archaeoastronomy 14:73-115. Bricker, Harvey M., and V. R. Bricker. 1983. Classic Maya Prediction of Solar Eclipses. Current Anthropology 24(1):1-23. Eidenbach, Peter L., 1981. Two Prehistoric Solstice Observatories in the Sacramento mountains, Southern New Mexico. Bureau of Indian Affairs, Albuquerque District Office. 32p. Grant, Campbell. 1978. Canyon de Chelly. The University of Arizona Press. 279 p.
Hedges, R. E. M. 1986. The Future Prospects of Accelerator Dating. In Archaeological Results from Accelerator Dating. Edited by J. A. J. Gowlett and R. E. M. Hedges. Oxford University Committee for Archaeology Monograph 11:163-165. Kossan, Pat. 1995. Ancient Carvings Falling to Developers. The Arizona Republic. Dec. 24, 1995, page B1. Final Chaser. Mayville. L. McKim, F. W. Eddy and C Ambruster. 1991. Lunar Standstill at Chimney Rock. Archaeoastronomy 16:41-50. Mixon, Benjamin and R. E. White. 1991. 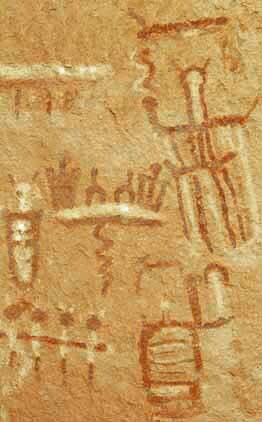 Sky Watchers of the Salt River Valley Hohokam. The Astronomy Quarterly 8:245-259. O'Meara, Stephen James. 1994. A Prehistoric Sun Watching Station. Sky and Telescope March 1994:96-99. Russ, Jon, M. Hyman, and M. W. Rowe. 1992. Direct Radiocarbon Dating of Rock Art. Radiocarbon 34:867-872. Science Digest. 1983. Anasazi Astronomers. Science Digest May 1983:24. Severin, Gregory M. 1981. The Paris Codex: Decoding an astronomical Ephemeris. Transactions of the American Philosophical Society 71(5):3-101. Sofaer, Anna, V. Zinser, R. M. Sinclair. 1979. A Unique Solar Marking Construct. Science 206(4416):283-291. Visit my Rock Art Pages, a dozen rock art pages with more than 60 photographs and numerous graphics focused on the American Southwest, especially the Colorado Plateau. All rights reserved. Your comments are invited: Contact.